Followed by the inauguration the friends for the day paired themselves and went to the stage and exchanged wearing the friendship band. 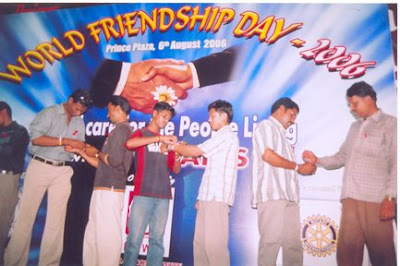 25 HIV+ friend, 25 non HIV friends and 20 volunteers participated in the program. They were trilled and excited when the exchanged the bands. After that they exchanged sweets as a symbol of the care and affection for each other. This event created an opportunity to discuss about stigma, discrimination, violence, marginalization, ill treatment, denial of treatment, privacy, quality of life, access to the ARV treatment and Nutrition for PLWHA. 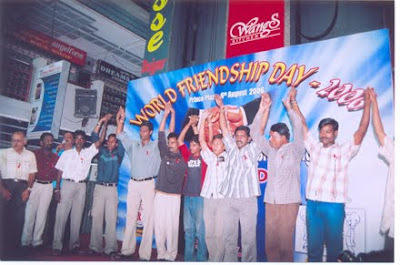 To empower people living with HIV/AIDS to involve themselves in organizing special days such as WORLD FRIENDSHIP DAY. 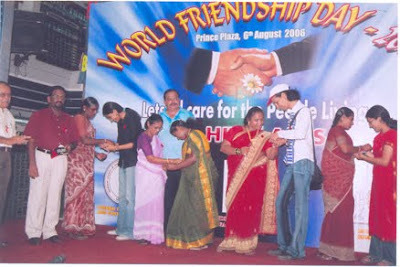 To create an opportunity for PLHA’s to express their friendship on World friendship day. To create an opportunity for the PLHA to exhibit their talent and skills. To address the stigma, discrimination, marginalization and misconception related to PLHA through the event with the support of Media on World Friendship day. Develop and disseminate positive messages regarding PLHA. The event was office inaugurated by lighting of the lamp by Dr. Ravindra President of Rotary Club of Chennai, Gemini and Mr.Muruganandham, NGO Advisor,Chennai Corporation AIDS Prevention And Control Society followed by community representatives. Mr. Hariharan, Secretary, ICWO welcomed the gathering and briefed the purpose and objectives of the World Friendship day for and of People Living with HIV/AIDS in Chennai. Mr. Muruganandhan , NGO Advisor of CAPACS expressed that it is an opportunity to exhibited their talents and skills. He believed the stigma, discrimination, marginalization and misconception related to PLHA can be addressed through the event. 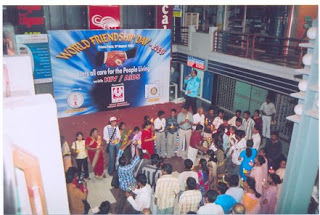 Dr. Ravindran, President of Rotary Club of Chennai, Gemini express that he was very happy that such a event was celebrated for HIV+ as it gave an opportunity for them to express their feeling and also a time to have fun and to cared. To address the stigma, discrimination, marginalization and misconception related to PLHA through the event with the support of Media on World Friendship day.Develop and disseminate positive messages regarding PLHA. Followed by the inauguration the friends for the day paired them selves and went to the stage and exchanged wearing the friendship band. The were trilled and excited when the exchanged the bands. After that they exchanged sweets as a symbol of the care and affection for each other. 25 HIV+ friend , 25 non HIV friends and 20 volunteers participated in the program. After they exchanges bands and sweets games were organized for the friends. ICWO took every effort to reach out to the local print, National, and International live media to cover the Programme for wider publicity. We have dissimilated all the e-groups so that within a couple of days it will reach world wide. Medias like The New Indian Express, The Hindu, Deccan Chronicle, , E-Nadu, Malayala manorama, Thina Bhoombi, ANI , UNI , DailyThanthi, Dinakaran, ,Malai Malar, Win T.V, Raj T.V, Dina Malar, ,E.T.Press Times and Mathrabhoombi, attended the World friendship day for HIV+ people. With the support of the media we will be able to remove the discrimination and negative attitudes of the general public towards PLWHA. It has reached a lot of readers and viewers. The event was concluded by a vote of thanks by the Ms. Arthi Tarun, program Manager of ICWO.